About Abel Tasman National Park: The Abel Tasman National Park is located at the top of the South Island, between Golden Bay and Tasman Bay, and is New Zealand’s only coastal National Park and its golden sandy beaches and crystal blue water make it a very popular destination for tourists and Kiwi’s alike. The park is named after Abel Tasman, the first European explorer to sight New Zealand 1642 after he anchored nearby in Golden Bay. The area was opened as a National Park in 18 December 1942 to mark the 300th anniversary of Abel Tasman’s visit. Covering an area of 225.3 km2 (87.0 sq miles), the park is the smallest of New Zealand’s national parks. The park has a range of natural wildlife and indigenous birds, insects, animals and plants, many of which are not found anywhere else in the world. The more common forest birds, like tui and bellbirds, korimako, can be seen along with pukeko around the estuaries and wetlands. Oystercatchers, shags, Koau, and little blue penguins can be seen on the coast. Dolphins are frequent visitors to the coast and New Zealand Fur Seals are commonly seen on the islands of the park all year round. How to get to the Abel Tasman National Park: The closest airport to the Abel Tasman National Park is Nelson, Nelson airport is only a 15 minute drive to Nelson city and a one hour scenic drive from the airport to the park entrance. You can take the Interislander ferry from Wellington on the North Island to Picton, on New Zealand’s South Island. The ferries take 3 hours and run around 5 times per day during the peak summer season. To drive from Picton to Nelson is 2 hours, and a further 1 hour to the National Park. 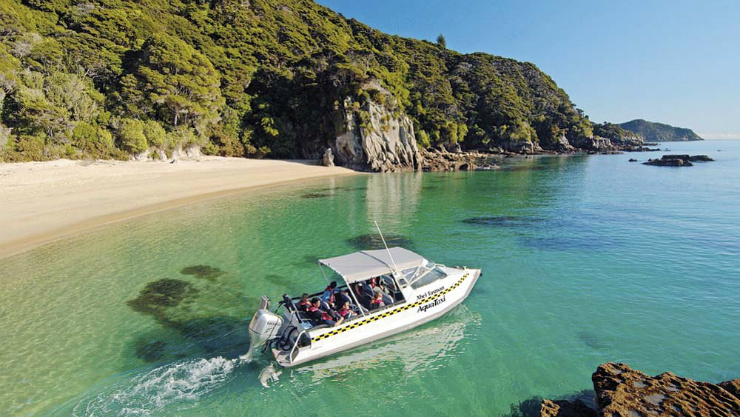 Water taxis are the most popular way to get around within the Abel Tasman National Park. Visitors with only a day to spend in the Park typically chose to take a water taxi to a bay from which they can walk a small section of the Coastal Track before being picked up at the end of their walk to be whisked back to Marahau on a return water taxi. Water taxis are also a great way to find a quiet beach to spend the day. How to spend your time in Abel Tasman National Park: The Abel Tasman is a walking and kayaking haven. The coastal track is 60 km long and can be walked as a multi-day walk over 3 to 5 days staying at huts, campsites along they way, or you can take water taxis and walk it in sections. Walking options: Walk the whole track in either direction, take a water taxi or kayak between different locations. Further information can be found on the Department of Conservation Website. 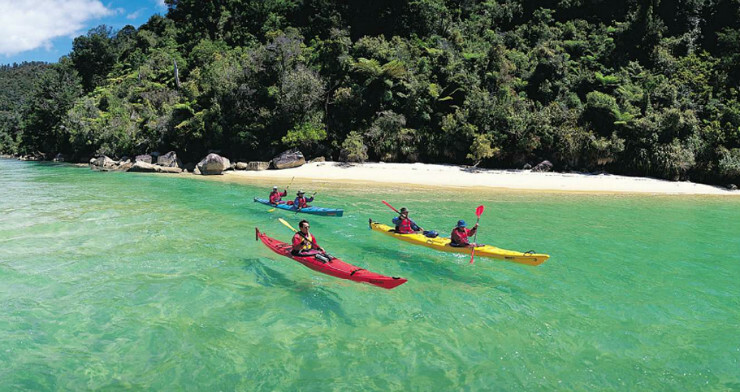 The Abel Tasman National Park is very popular with kayakers. You can take half day, full day or multi day kayaking trips, or rent kayaks and go solo, only recommended if you have previous sea-kayaking experience. 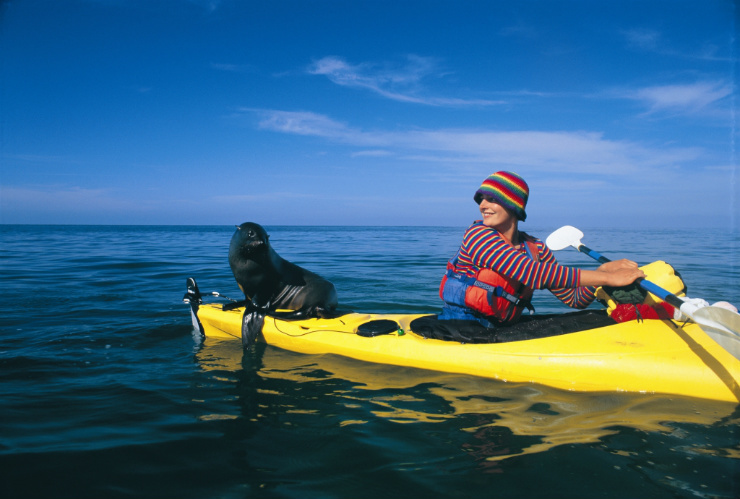 Kayak to Split Apple Rock, find secluded beaches and islands along the way to stop for a picnic, visit the New Zealand fur seals at Tonga Island or Pinnacle Islands. Combine a kayak trip with a hike, there are lots of great options, talk to our team for more information. A couple of our recommended options are: Kayaking to Tonga Marine reserve, with highlights such as the beautiful Onetahuti beach, Tonga Island Marine Reserve, Pinnacle Island and Falls River lagoon. A full day tour which includes around 12km of paddling, and two sea shuttles. 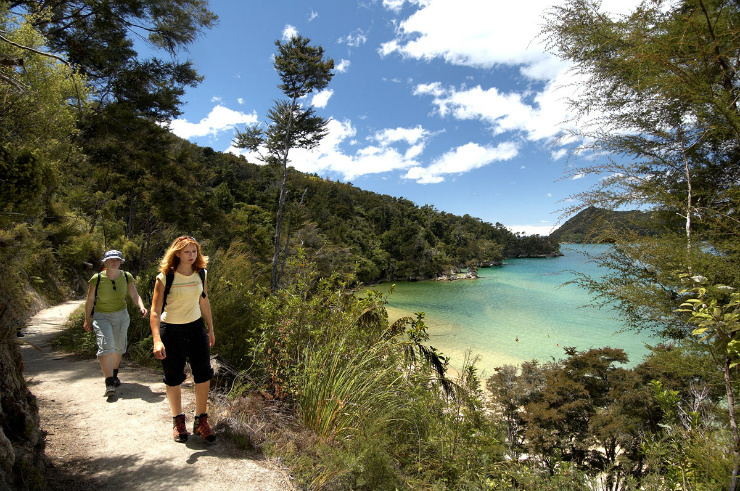 Or the Heart of the Park, which combines a scenic cruise to Onetahuti Beach, and unguided walk through lush native forest to Bark Bay, where you will meet a guide and kayak through pristine waters of Anchorage and Torrent bays, see Pinnacle Island and Falls River lagoon. This is a full day adventures with around 4 hours of walking, 3 hours of paddling and two sea shuttles, so a decent level of fitness is required. Kayaking trips are dependent on the tides, and it’s often necessary to take a water taxi one way. Luxury Adventures recommended using a guide – we work with experienced guides who all have excellent knowledge of the local area. Kay Campbell is a luxury travel consultant for Luxury Adventures. Talk to us about planning your next visit to New Zealand, Australia or the South Pacific Islands.